I recently got tired of paying $10 a pop for smoked turkey legs at festivals. Y’all know Blerdy Momma is too cheap for that. So after plenty of research about the smoking cooking technique, I put together my own brine recipe and set out to smoke my own turkey legs. It turns out smoking meat is not really a complex process. It is time-consuming, but really not that complicated. Because it takes so long, I highly recommend smoking more meat than your family will eat in one sitting. I guess that’s really just limited to the size of your grill. I like to buy fresh turkey legs on sale and store them in my freezer. Once I’ve got at least a dozen or so, it’s time to uncover the grill! Once they’re smoked they can be eaten immediately, stored in the fridge, or frozen for a later date. Perhaps you can see why this is my most highly-requested recipe when it’s time to feed a group of friends or family! My brine recipe has it’s own post over here, or feel free to come up with your own. (Tell me about it in the comments section!) I tried to include enough pictures to illustrate the key steps because this is such a long process. Have patience, though. You will not regret it. Reserve 1-2 cups of brine to be used as the mopping liquid. The next day, Light your charcoal. Put as much space as you can between the charcoal and the grill grate where the turkey will be. The goal here is INDIRECT heat. Soak about 2 cups of wood chips in a bowl with water for at least 15 minutes. Don’t forget to wipe the the grate with oil to keep your meat from sticking. Add a generous handful of wet wood chips to the coals once they are ready. Also add a smaller handful of dry chips to get some extra smoke when you first start out. Put the turkey legs onto the grill grate and cover the grill. Discard the brine. Every hour, add some wet chips to the coals. 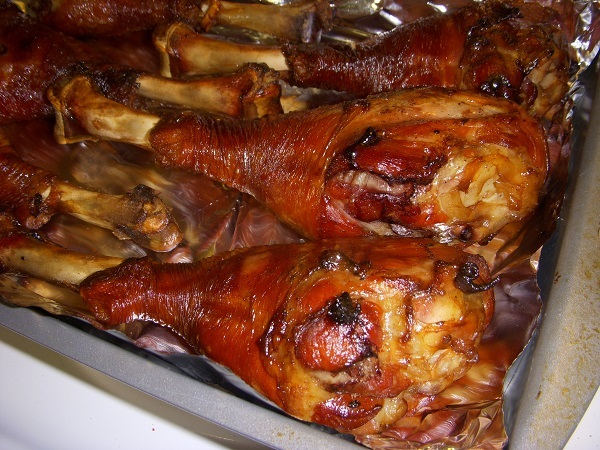 Mop and flip the turkey legs (just like brushing on BBQ sauce but use the reserved brine). During the last hour, add dry chips for extra smokey flavor. The turkey legs should be done after about 4 hours. I do not have a dedicated mopping brush like many people do. I find that lint free, clean baby washcloths work just as well when held between some tongs. You can get them in packs at Dollar Tree. If you have any questions, email me at blerdymomma@gmail.com.